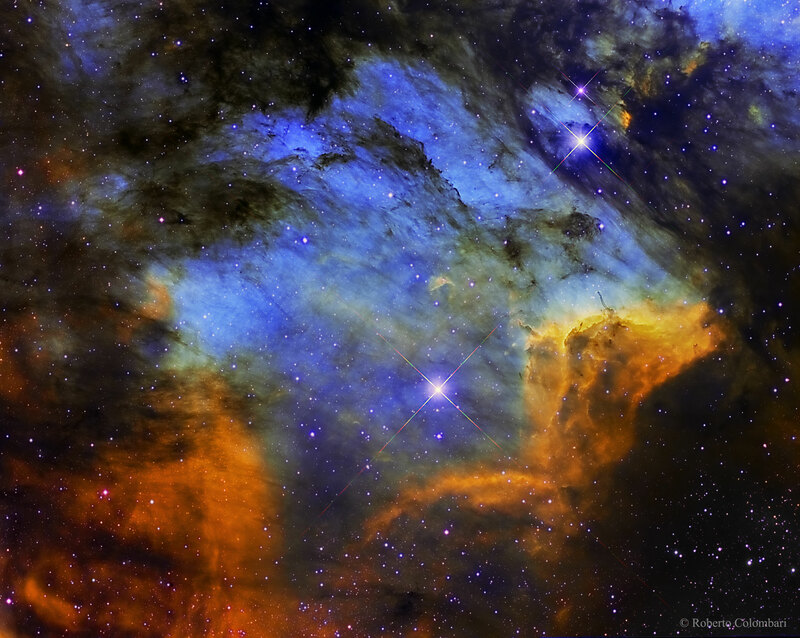 Explanation: The Pelican Nebula is slowly being transformed. IC 5070, the official designation, is divided from the larger North America Nebula by a molecular cloud filled with dark dust. The Pelican, however, receives much study because it is a particularly active mix of star formation and evolving gas clouds. The featured picture was produced in three specific colours -- light emitted by sulfur, hydrogen, and oxygen -- that can help us to better understand these interactions. The light from young energetic stars is slowly transforming the cold gas to hot gas, with the advancing boundary between the two, known as an ionization front, visible in bright orange on the right. Particularly dense tentacles of cold gas remain. Millions of years from now this nebula might no longer be known as the Pelican, as the balance and placement of stars and gas will surely leave something that appears completely different.